VR manufacturer Xtrematic showed off its latest simulator, X-Bike, at the recent DEAL show in Dubai. International visitors at the event were able to try out the new concept, distributed in the region by Warehouse of Games, which offers several forms of racing and different games within the one compact unit. 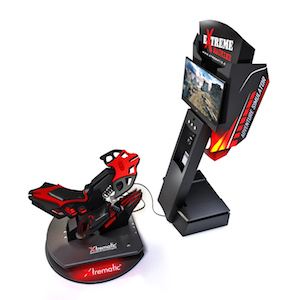 The follow-up to Xtrematics’s Extreme Machine, X-Bike attempts to take the VR experience of its predecessor a step further, offering jet ski, quad bike and motorcycle races and even dinosaur flights on a specially designed bike styled seat, which the player tilts in all directions to control the virtual reality action. A permanent queue for the X-Bike provided the feedback that the Belarus-based company was looking for, with visitors of all ages being able to control the game with comfort. Moshinsky added: “Over the three days of show, we received a lot of positive feedback. Most people who tried it were satisfied with the control system saying that while it’s very realistic and sometimes a challenge, it offers a steady, learning curve, which was what we hoped for in the design stage. We even had bike owners comment on how realistic it is. The best feedback we got though were the smiles of the players as they experienced it. It’s the most important thing.